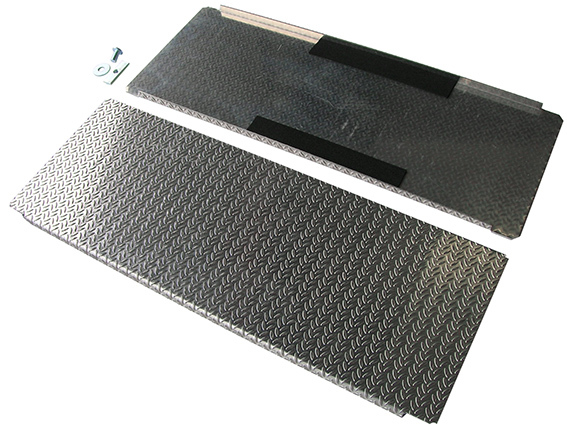 If you wish to create a robust and resistant walkable platform that partially or fully occupies the surface of your UPRACKS roof-rack, this is the easiest and most effective solution. The kit is composed of 2 pieces in almond-pattern aluminum available in multiple modules and attachable into the grooves of the roof-rack cross-bars (planks) by means of rounded-head bolts. By this system you can build up and customize a resistant platform that can be extended on the entire surface, or just partially on some areas of the roof-rack, where you need to have a walkable area. The system has been conceived to give you the possibility of placing and sitting on camping chairs on the roof-rack, thus using the surface of the roof-rack as a real terrace. Customers who mostly take advantage of this platform are: photographers, hunters, geologists who need a higher point of vision relative to the ground and need to walk safely onto the roof-rack. Each plate is 50 cm long and 19 cm wide.